Study under world-class scientists and instructors. Faculty members in the Division of Animal Sciences have expertise in nutrition, genetics, physiology, meat science, reproduction, and animal management. Current faculty members have received numerous prestigious University system, regional, national and international awards regarding teaching, advising, research and extension. At Mizzou, you learn from faculty that conduct the research to create the knowledge that is eventually used in textbooks at other colleges. Here, you get the information before it is in the books! As a Mizzou Animal Sciences student, you will be assigned a faculty member who will serve as your academic advisor. During meetings with your academic advisor, you will have the opportunity to build your course schedule to meet graduation requirements, find experiential learning opportunities and get help when needed. The Division of Animal Sciences has beef cattle, dairy cattle, swine, poultry, sheep, and equine farms and a meats lab within 12 miles of the campus, which allows these farms and facilities to be heavily utilized in the teaching program. 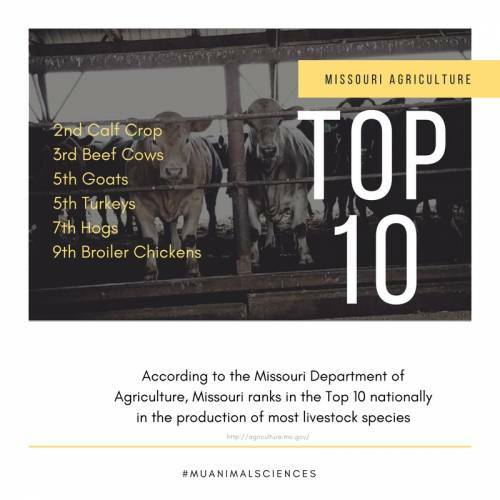 Combined with active research programs at the farms and in labs on campus, Mizzou students obtain “hands-on” learning from their animal sciences courses, while having employment opportunities and research experiences. Agriculture is a foundational pillar of the state of Missouri. As such, our Animal Sciences program and its participants benefit profoundly through the opportunities our location uniquely provides. Animal Sciences focuses on whole-animal biology, which contributes to advancements in livestock production, animal health and human health through innovative research and its application. Is This Major A Good Match? …then you should check out Animal Sciences!